Imagine you’re out in the Deep Playa with your friends on a warm, overcast night. Suddenly, all the generators and batteries in Black Rock City fail. All the lamps and fires of the City go out. What do you do? Come celebrate the end of the Long Count Calendar’s 13th b’ak’tun at the weirdest party of the year. 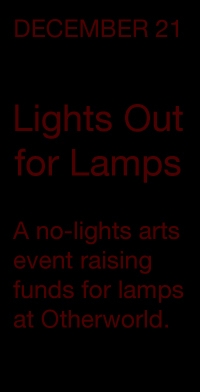 Proceeds go to lamps for Otherworld. This is a blackout party, an event celebrated in pitch-black conditions: no lights, no glowies. Read the Survival Guide before buying a ticket to understand what you’re getting yourself into. We would like to thank you in advance for supporting this experimental event! When you purchase your ticket online you will be given an opportunity to support this event by lending your time as a volunteer. We welcome participants who will help the event at Rangers & Peer Support, Gate & Greeters, DJs, and Bartenders. We also encourage you to bring non-visual displays of art (tactile, auditory, taste and smell).